e·mer·gen·cy: a serious, unexpected, and often dangerous situation requiring immediate action. From natural disasters like hurricanes and earthquakes, to power outages and house fires, preparation is required to adequately respond to unexpected and dangerous scenarios. Being informed, making a plan, and having a medical kit ensures you can be better prepared to deal with an emergency. Be Informed: Know what potential emergencies can happen in your area or where you travel and know how to prepare for and respond. Learn how you can receive emergency alerts from TV and radio, to social media and mobile apps. Many cities and counties have a reverse notification system for emergencies. Depending on what services are available in your area, you can also sign up to receive notifications on your cell phone, e-mail and by text. Make a Plan: Once you know what potential emergencies exist in your community, plan accordingly and discuss your plan with family members and neighbors. Know your shelters, how to stay in contact with one another, and what you will do in different situations. Practice your plan at least twice a year and update it according to any issues that arise. Learn about emergency plans at places where your family spends time: work, daycare and school, faith organizations, etc. Build a Kit: Be prepared with the proper supplies you may need in an emergency or disaster. Keep your supplies in an easy-to-carry emergency preparedness kit and check your kit regularly to assess expiration dates, and working condition of supplies. From the basics like food, water and medical supplies to pet supplies and extra clothing, you’ll want to consider the needs of your family and prepare accordingly. The Red Cross and FEMA have an extensive list of what to include in your kit. First Aid Kits: When considering a first aid kit take into account the number of people you may need to treat as well as the medical needs of your family. Depending on your needs also include medical supplies such hearing aids with extra batteries, glasses, contact lenses, syringes, prescription medications, etc. You’ll also want to have a first aid guide handy, or better yet take a first aid class through your local Red Cross. 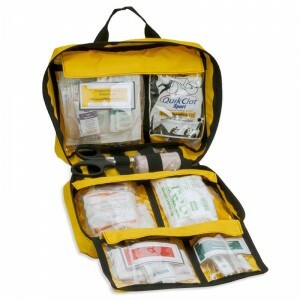 You may want to consider a complete medical kit like Chinook’s Emergency Preparedness Medical Kits (EPMK). 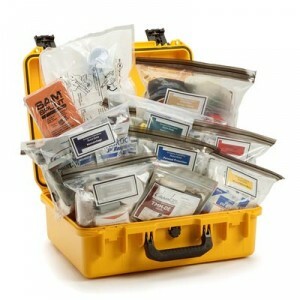 Unlike basic first aid kits, Chinook’s EPMK Kits features advanced medical supplies ranging from survival blankets and protective masks, to tourniquets, hemostatics, and pressure dressings designed to increase your chances of survival in the event of a medical emergency or natural disaster. The bright yellow colored kits keep medical supplies organized and ready to use at a moment’s notice. First Aid Kits Where You Need Them: Having a first aid kit at home won’t do you any good if your emergency is away from home. Chinook recommends having different kits to deal with emergencies at home, work, car or day trips, and offers a variety of kits to meet any scenario and fit any budget. 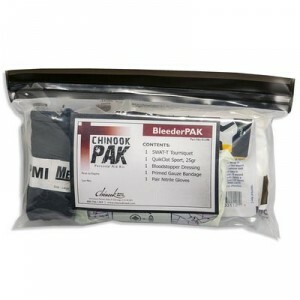 A small personal kit like Chinook PAKs are ideal for day trips, backpacking or to keep in the car. Mid sized kits like Chinook’s Plight of the Living Med, offer a more robust medical kit that is still compact enough to be carried or kept in a car. Larger kits like the EPMK are ideal at home or office and ensure plenty of supplies on hand to treat various medical emergencies that may involve multiple people. EPMK Level 3 and 4 Kits have more advanced medical products, and while personally you might not know how to use advanced medical items, in an emergency you may encounter a medically trained person who does.